Let's map out which app development trends are set to dominate in 2017. It is clear to me that mobile applications are fast becoming the main driver of accelerating digital transformation in businesses. Earlier this month we published our fourth annual survey, The State of Application Development: 2017 Research Report, which demonstrated unmistakeably that mobility requirements within the enterprise are indeed soaring. Our research took us around the globe, connecting us with more than 3,200 respondents from over 40 countries and 28 industry segments. From this, we went on to identify seven key findings which reportedly impacted every IT professional from the CTO to front line developers but, the thing that really came out above all else was that the unrelenting speed of change within the industry was pretty much unanimously identified by all of the respondents. As applications play an increasingly important role in the digital business economy, developers are constantly on the lookout for the practical, realistic trends that will make them more efficient and effective in their roles. Regardless of the industry, employees and indeed customers are growing less and less tolerant of manual, paper-based processes that only seem to slow them down. Certain levels of access to a service or information are becoming the norm and these expectations will only continue to increase as time goes on. This in part occurs because some organisations are already doing a very good job of digitising work processes, disrupting their industries, and setting the bar higher for others within it. As a result, those that lag behind serve as a great disappointment to the growing community of customers, employees, and partners already beginning to live and work in an uberised world. As these individuals get frustrated their loyalties will begin to shift towards those that can keep up. In 2017 this rate of digitalisation will accelerate further, perhaps becoming even more extreme as disruptive tech like AR and VR break out into mainstream business consumption. Back in 2014 Gartner predicted that by 2017, 75 per cent of mobile apps would not pass even basic security tests. Sadly, they were not far off the mark. As we reflect on the early months of 2017, there is no denying the fact that many of the apps that are currently available still fall short of delivering security and privacy to users who are vulnerable to things like data interception attacks and malware as a result of vulnerable code. On top of this, risks are increased on a daily basis by an emphasis on end-user convenience over basic security. As a result, organisations tend to lack urgency to address such threats. As IT teams are hit with daily demands to build new apps they are struggling to keep up. Therefore, it is hardly surprising that this rush to release phenomenon is on the rise. Unfortunately, one of the potential consequences of this rush is compromised security. At the beginning of the year Apple made a series of security changes, stating that all IOS apps must comply with App Transport Security (ATS) data encryption requirements. Despite this requirement, recent research has found that only three per cent of enterprise apps are actually fully compliant with the new security mandate. By default, all mobile applications built using the OutSystems platform have HTTPS enabled for all screens and integration to keep data secure while in transit by encrypting it, something clearly specified in Apple’s new mandate. But this is by no means the norm as poor programming practices often mean that numerous apps fail to make use of the security features available on mobile devices. It is hardly alarming then when we hear about the latest major security breach on the news. As 2017 pans out, I believe that a lot more will need to be done to address such security problems. As I have already indicated, we’re currently experiencing a crisis point within the enterprise where the demands for digital transformation have far exceeded the capacity of IT teams to deliver. 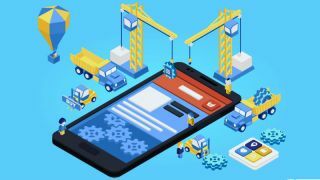 An increasing number of mobile apps will no doubt be built with low-code platforms in 2017 as IT starts to re-think, re-tool and re-engineer how technology gets delivered. The platforms that will succeed will be the ones that make it easy for developers to build complex apps for the enterprise. The release of OutSystems 10 proves for the first time that a low-code development platform is capable of accelerating the development and deployment of the kinds of advanced mobile applications that previously required extensive hand-coding. Interestingly, and, as confirmed in our research, some companies have already proven that the key to cracking the mobility challenge may be as simple as bringing in the right technology to enable people in non-IT roles to build solutions. By empowering organisations with the right technology, app development work can be spread among more people. This, in turn, eases pressure on IT teams, freeing them up to meet business needs. This reality is having a widespread impact on a variety of factors, including hiring practices and, more specifically, the types of skill sets today’s companies are seeking. It’s also paving the way for the rise of citizen developers, who when enabled with low-code platforms, are able to achieve considerable results. Of course some trends and technology are certainly going to be more exciting than others, but it is what actually resonates with the developer community that is key. After all, it will be as result of these that developers will be able to create smart, seamless and intuitive apps to drive digital business through the rest of the year ahead.